International Digestive Disease Forum (IDDF) is a premier conference that brings together the world’s GI community. Every year, more than 1000 participants from leading experts, key industry players to young investigators congregate here to update their knowledge, learn breakthrough technology, network, and exchange ideas. Since the 2011 inaugural meeting, IDDF has been steadily gaining high recognition and strong anticipation in the Asia Pacific Region. It is now amongst the most dominant GI conferences. The brainpower behind IDDF is a group of eminent professors from The Chinese University of Hong Kong. Many of them will also preside in the 2017 organizing committee of Asian Pacific Digestive Week (APDW). In 2017, these same GI experts will dedicate their expertise to orchestrating the concatenation of IDDF’s high energy core programme and APDW events into a university and society joint conference. Justin Wu, Chairman of both IDDF’s and APDW 2017’s Organizing Committee, tells us more details in an exclusive interview with Scope. Why is IDDF coalesced with ADPW in 2017? Wu: There is a number of reasons. APDW is hosted annually in a different country but has never taken place in Hong Kong. IDDF, on the other hand, is held exclusively in Hong Kong every year. Because our city is an important hub of GI research and clinical service, known for its high standard of healthcare and significant landmark research, we feel obligated to contribute to the GI community by hosting the prestigious APDW conference in Hong Kong. 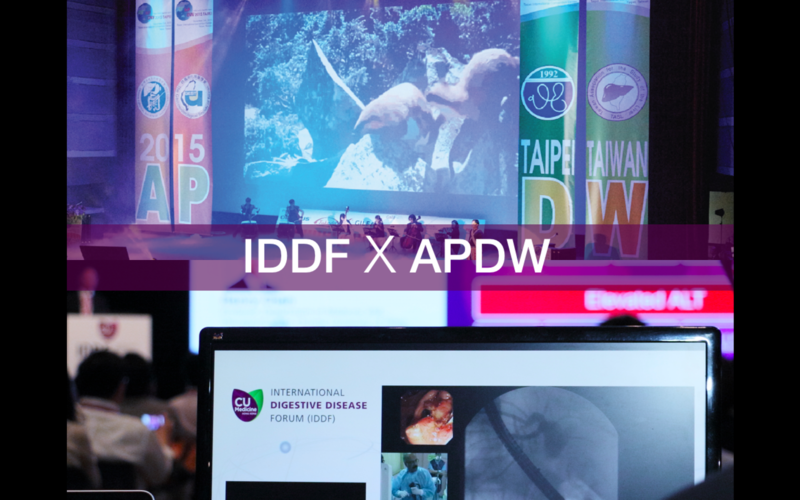 Since we are hosting APDW in 2017, we think it highly feasible to unite IDDF with APDW so the unique features of each can complement the other. How will IDDF and APDW complement each other when amalgamated? Wu: IDDF and APDW are different in many ways and those differences can add richness and depth and variety when the two conferences are amalgamated. IDDF is an academic conference organized by a leading GI institute whereas APDW is a regional GI conference hosted by various national GI societies. Being a university-initiated event, IDDF has a firm focus on inter-institutional collaborations whereas APDW’s focus is at a national societies’ level. For example, IDDF 2016 has jointly organized a Master Class with the University of Melbourne and has presented the Best of DDW with its official organizer, University of Michigan. IDDF’s extensive collaboration network with prestigious universities overseas will bring more participation to the APDW event and further enrich its attendance profile. Likewise, APDW’s far-reaching network with national GI societies can open up more partnership opportunities for IDDF. Together, the two conferences can bring together a larger GI community for exchange and collaborations both at the institutional and societal level to propel forward the advancement of GI studies. How will IDDF 2017 be featured in APDW? Wu: IDDF’s core programme—our two plenary named lectures, oral presentation, Young Investigator Award, will all be featured as an independent event at APDW 2017. IDDF events that are not scheduled for Saturday and Sunday will take place as satellite events of APDW. What is unique about IDDF 2017? Wu: 2017 is the first time IDDF is featured in another conference. Through the cross-fertilization, IDDF and APDW will be mutually complementary. IDDF will introduce its extensive academic network to the society-based APDW conference while APDW will help IDDF expand its presence and recognition beyond academia into the wider global society. What is interesting about IDDF 2017 is that it shares leadership with APDW 2017. I, myself, will chair both IDDF and APDW 2017. Professor Francis Chan, another IDDF Organizing Committee member will preside as the secretary-general of the APDW 2017 Board of Directors. In short, the IDDF team will fully support the organization of APDW and impart the IDDF culture to APDW to further enrich its diversity. Will future IDDF continue to feature at APDW? Wu: IDDF is held annually in Hong Kong whereas APDW takes place in a different city every year. Since Hong Kong will host APDW in 2017, by serendipity, IDDF will be featured in APDW 2017 . In 2018, IDDF will run once again as an independent academic-conference. We do, however, anticipate future collaboration with the APDW and other universities. More than ever before, we are exploring partners to jointly organize events for young investigators to meet the rising demand for clinical research training and overseas fellowship opportunities in the Asia Pacific region. As a leader in digestive disease studies, the Institute of Digestive Disease will, through IDDF, continue to contribute to the advancement in research, education and exchange in gastroenterology, hepatology and endoscopy.